81 M2 appartment completely renovated in 2015 in a real traditional chalet atmosfere made of local wood with mountain decoration and furniture. Facing the mountains, you have view to the Mont-Blanc! Ideal placed in the center of ARCS 1800 (Charvet Village) in the MIRAVIDI residence. From the appartement, you are near to the ski piste, the shops, tourism office, restaurants, skilift office,... During the summer, the 27 holes golf is near to the appartment and the Sport Club offers you the possibility to practice more than 30 sports and artistic activities.. In the appartment, you will find a confortable convertible sofa, a monastry table suitable for 9/12people, a fully equiped kitchen, 4 sleeping rooms, 2 bathrooms, 2 independant toilet and a lot of place for your personal things. Room 1 with a 140 bed and a 80 bed, Room 2 with 2 x 80 beds, rooms 3&4 with a 140 bed and finally, the convertible with 3 x 80 beds. The appartment is very comfortable for 9 persons but can accept 12 persons by using the convertible. On the top of that, you get all the necessary to make your holidays a pleasant time with among them a fondue, raclette, wok, tea and coffe machines, 4 LCD televisions, DVD-DivX reader, HIFI with CD and MP3, ... You are personally welcome by a local person that will be your contact person during your stay. Free wifi available in the appartement. Company manager. I distribute fixing products (nails, dowels, anchors) made in Holland (HJZ) and Finland (SORMAT) to a clientele of wholesalers and fasteners specialists in Western Europe. I discovered the ARCS in 1985 and after visiting most of the major French and Austrian resorts, I returned to Les Arcs 1800 in the village Charvet to realize that it was the most pleasant resort (reception and social life) and the most practical (departure and return skis - access by TGV and funicular - free shuttles). So I chose to invest in the MIRAVIDI building. A family residence and calm although very close to the center of the village. I bought 2 apartments side by side to make a 'big' apartment in 2008 and in 2014, an apartment just above to be able to create a space in duplex worthy to receive 2 or 3 families in the greatest comfort. The most important for me is the altitude of the station. It is essential that snow cover be at the rendezvous and this is generally the case at ARCS. I always come early in the season to heat the apartment and check that everything is functional. I come back again at the end of the season (Easter) to do the inventory. I was never disappointed by the snow in December. In April, the spring snow is less pleasant but the sun and the beautiful days always make the stay pleasant. In July, we come back to do the big cleaning and bring the small repairs and modifications indicated by our tenants. Our children are very fond of the club and participate in the proposed activities (tree climbing, archery, circus school, trampoline, ...) Now that they are older, they can participate in 'extreme' activities (mountain biking, rafting , Canyonning, Via Ferrata, ... and Thursday's bivouac). My wife and I enjoy the relaxation sessions, swimming pool, golf, tennis and hiking. The apartment was excellent and exactly as advertised. There was plenty of living space and a fully-equipped kitchen. It is well-located in the heart of Arc 1800 and within touching distance of shops, bars, restaurants etc. If you arrive early as we did, there is a very good bagagerie service in the nearby bus station which you can use at a small fee. Very nice property and comfortably accommodated our group of 8. Extremely convenient for shops and just a short distance from lifts- across one road, up one flight of steps then down one short gentle slope. Clean and comfortable with lots of well thought out storage space so that it never felt cluttered. Also a handy storage area for skis and boots within the apartment ( the block doesn’t have a boot room). Thank you Sarah for your comments. We do our best and look forward to see you again in LES ARCS. Great location to stay, easy access for skiing. Very well equipped and well looked after apartment, plenty of space for our 2 families, thanks. A great apartment, 2 mins from the slopes in the middle of Charvet. The apartment worked really well for 2 families - 4 adults and 5 kids across 4 rooms and a central area for food and relaxing with a cup of tea, and has everything you will ever need on a trip. The owner has made this a really nice apartment both with the layout and location, it’s more like a home from home than a holiday apartment - it’s easy to cook at home, we used the raclette a couple of times and the kids loved it, Nicolas ( the host ) was happy to guide us through any queries pre trip and Sabrina is in Les Arc full time in you need her. The apartment is in Charvet and the slopes are a 2 minute walk away & you can then ski down the last 100 metres to the ESF ski school without having to walk👍�. Thank you very much Jeremy for your comments. I am really proud you appreciated our service based on the experience of our guests. I hope to see you next year in Les Arcs. 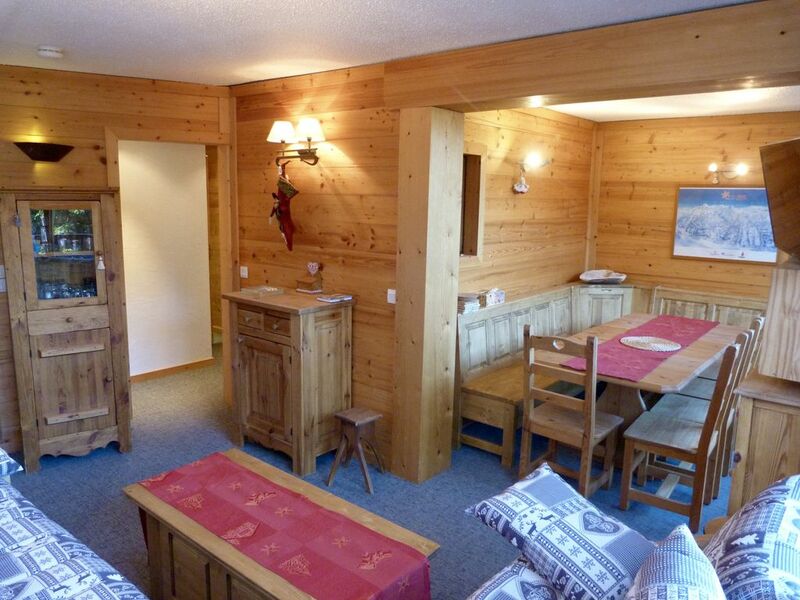 Nice apartment, close to the slopes, shops, restaurants and bars. The apartment was very comfortable, clean and well equipped. We were a party of seven, 4 adults and 3 teenagers, while the apartment can sleep more I would not recommend many more as it would be too small. It is very close to the slopes and all amenities. We had great service and communication with Nicolas the owner and Sabrina, his contact in the resort, was extremely helpful. There was slight confusion over what we needed to bring and what was included in the apartment, I think this was a translation issue in the agreement so it may be worth checking this before you go if you are not sure of anything. All amenities are close by and there is a laundrette in the apartment building which is useful. The wifi was good in the apartment and 4 rooms had TVs, but unfortunately there were no English channels. This didn't really matter but it would have been nice to have one or two. I would definitely recommend this apartment, we really enjoyed our stay. See you next time with pleasure. "This property was exactley as described in the advert, its in a perfect location to ride, lots of shops, bars and cashpoint near by.Very clean and new looking, had everything we needed to cook every day.wonderful aprtment would love to return, and the free parking is very handy when driving into the Alps." By car : Motorway A43 to Albertville, N90 to Bourg Saint Maurice and 15 km to the ARCS 1800. By train : Direct TGV train (Thalys - EUROSTAR) to Bourg Saint Maurice, then just take the bus or the finicular to the ARCS 1800. You can reach the appartment with your ski. The ARCS 1800 is a station without cars but you have a lot of parkings (inside and outside) close to the appartment. You can reach the appartment with your car when you arrive and leave. Our contact person will welcome you and can help you during your holidays. Inside the appartment, you will find the necessary local documentation. At the door of the residence, there is also a laundry. L'acompte est dû à la réservation et est perdu en cas d'annulation. En cas d'annulation 30 jours avant l'arrivée, le solde de la location est dû. Les arrivées et départs aux ARCS se font le samedi. Vous pouvez arriver ou partir un autre jour mais cela ne change rien au tarif; nous louons par semaine. Le ménage de fin de séjour n'est pas compris. Si vous le souhaitez, vous pourrez le commander sur place lors de votre arrivée. La taxe de séjour de 0,8 euro / nuit/ personne. N'hésitez pas à me contacter si vous avez des demandes particulières.